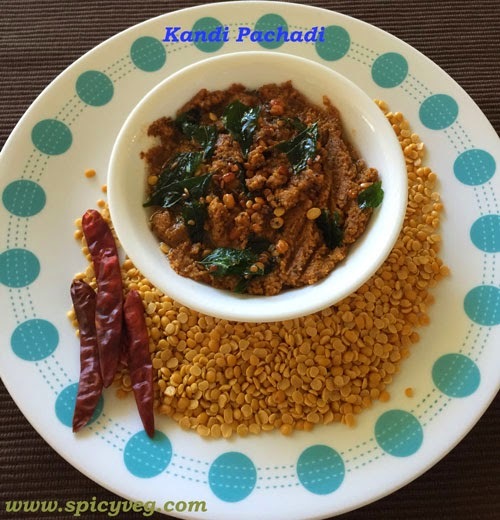 Toor Dal Chutney is a famous dish in South India and it is an Andhra delight.. Kandi Pachadi is very easy to make and is typically eaten with hot rice and ghee.This is a great tasting Andhra delicacy made with the protein-rich Kandi pappu (Toor Dal, Pigeon Peas). This is so easy to make with a few ingredients. 1.Take a frying pan and add 1 cup of toor dal and dry roast the dal on low flame till it turns light brown . 2.Switch of the flame and keep it aside and let it cool. 3.Heat 1 tsp oil add redchillies and cumin seeds roast the ingredients till turns crisp. 4.Take a mixie jar add toordal ,cuminseeds ,red chillies, salt and tamarind paste grind it to a coarse paste adding little water. 5.Grind the mixture to a desired consistency. Take out into serving bowl. 6.Heat a Pan and add 1tbsp of oil then add all the ingredients under tempering and pour on the chutney. 7.Serve with steamed rice and dollop of ghee. Note: Add the tempering just before serving to keep the moisture in the chutney.